Solid, Seriously Stylish Homes. The Perfect Location. An exciting new community is coming to life in Collingwood. Located on the 10th line south of Mountain Road, Red Maple Community is close to local amenities while being nestled in the breathtaking backdrop of the Niagara Escarpment and backing onto the beautiful Georgian Trail. There is no need to compromise style or quality for affordability. At Red Maple Community you can live in style and walk right across the street to play a round of golf at the established Blue Mountain Golf and Country Club. On a sunny Saturday take a stroll to Currie’s Farm Market and take advantage of seasonal fruits and vegetables, many of which are grown on their own farm. 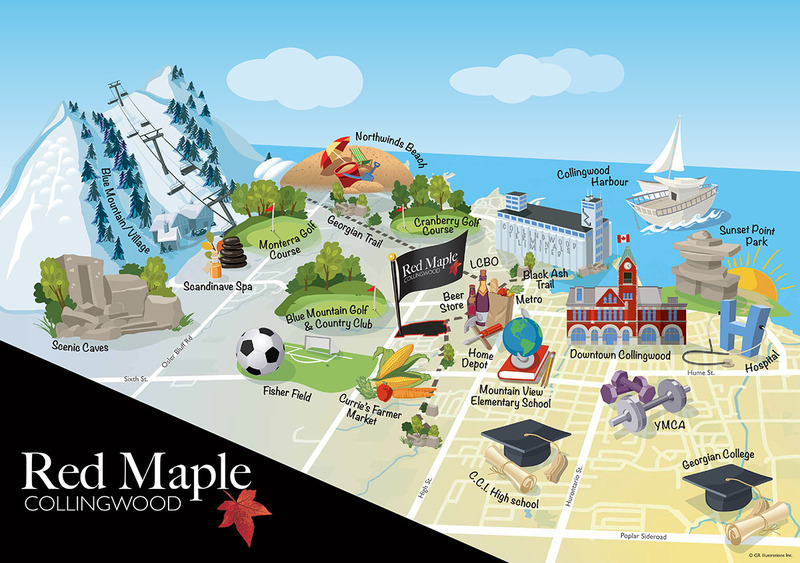 Red Maple offers a variety of solid, stunning homes to choose from plus all the amenities you could ever want all in a booming 4-season community that is rich in natural resources, recreation and local convenience. The perfect neighbourhood is at ideal place of convenience and a relaxed sense of community. One visit to Red Maple and you will agree that this is truly the Perfect Neighborhood. Walk across the street and enjoy a round of golf at the established Blue Mountain Golf and Country Club. Take a stroll down the street to Currie’s Garden Market to purchase locally grown fresh fruits and vegetables. The Black Ash Trail forms an integral part of the Collingwood’s extensive trail system, and includes the Georgian Trail that runs between Collingwood and Meaford. Collingwood’s trail system offers endless opportunities for cycling, hiking or dog walking. Collingwood’s regional commercial centre is only a ten minute walk from Red Maple, and offers a wide range of stores, eateries, and conveniences. Enjoy our introduction video below. Click on a model name for details. The Heritage A – B 1,470 Sq. Ft. The Boardwalk A – B 1,654 Sq. Ft.
with Loft A – B 2,179 – 2,181 Sq. Ft. The Harbourview A – B 2,556 – 2,434 Sq. Ft. The Colberry A – B 2,722 – 2,674 Sq. Ft.
5 bedroom A – B 2,674 – 2,953 Sq. Ft. The Georgian A – B 3,342 – 3,317 Sq. Ft.
5 bedroom A – B 3,663 – 3,634 Sq. Ft. The Currie A – B 1,179 Sq. Ft.
with Loft A – B 1,703 – 1,713 Sq. Ft. The Underwood A – B 1,514 – 1,527 Sq. Ft. The Hamilton A – B 1,796 – 1,759 Sq. Ft. The Cranberry A – B 2,057 – 2,053 Sq. Ft. The Townhomes 1,207 – 1,802 Sq. Ft.
All dimensions are approximate. Sizes and specifications are subject to change without notice. E. & O. E. All illustrations are artist’s concept. Actual usable floor space varies from the stated floor area.